The Alice Springs Town Council has its problems with graffiti but next month it will co-sponsor a festival that includes a workshop teaching the often troubling art form. At least that was the plan until the workshop was cancelled – apparently over some people not having an Ochre Card which is required by anyone teaching children, whether graffiti or other things. The workshop organisers are saying they are seeking discussions – watch this space. The function was due to be part of a Youth Arts and Music Development Festival starting on October 24 and sponsored by the council, in conjunction with the Alice Springs Youth Action Group. 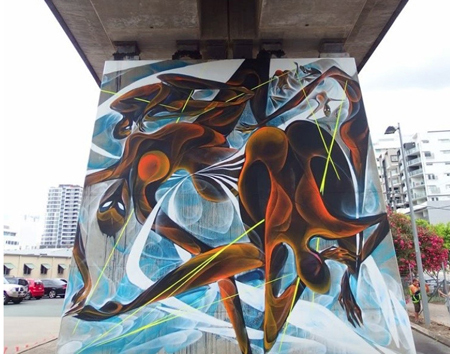 It was due to feature graffiti artist Mik Shida whose work (pictured) is well known throughout Australian capital cities and internationally. Deputy Mayor Steve Brown, who has been known to be opposed to graffiti in public places of Alice, says although he wouldn’t describe himself as a connoisseur of the art form, he does recognize the skill and creativity required to produce such works. The workshop will be focusing on the use of spray paint as a medium and aiding the development of individuals’ skills. “Given that there does exist a legal well-recognized and accepted form of graffiti art I guess that it should be taught to those interested in learning the skills,” Mr Brown says. The workshop – if it goes ahead – will be open to the Alice Springs public, for ages 12 to 21, over three weeks. Participants’ work will be displayed in an exhibition at Witchettys, Araluen, on November 20. Graffiti range from simple written words to elaborate wall paintings, and they have existed since ancient times, with examples dating back to Ancient Egypt, Ancient Greece, and the Roman Empire.The term graffiti referred to the inscriptions, figure drawings, and such, found on the walls of ancient sepulchres or ruins, as in the Catacombs of Rome or at Pompei. designed to make you frown. to annoy the monied brigade. so I kick them into touch. is my mean and brooding soul. Graffiti tells a story, in colours, not in black and white but also not in grey. Graffiti is hieroglyphics, runes and geoglyphs. From Egypt to Britain to Peru. Graffiti is on the walls of caves. Graffiti is just another persons expression. Let it be taught, so it’s good. So organise the ochre card and lets have some quality graffiti. because bad Graffiti is close to grey. There are quite a few exemptions in regards to the requirement of an Ochre card (http://www.workingwithchildren.nt.gov.au/clearance.html). Besides, getting clearance is a fairly quick and easy exercise. Cancelling an event for this reason seems a little … odd? On another topic, I believe I read somewhere recently that the council has not once paid out a single reward for the dobbing in of a vandal that lead to a prosecution. I guess this is not surprising. I recall sending a photo of several vandals, caught in the act, with faces clearly visible to the main ASTC email – I did not even get a response. Hope they are more careful than others have been in the past to ensure it doesn’t become a workshop on the use of spray paint as an inhalant. Territory Business Centres (TBC) Alice Springs. Graffiti is exciting. Hopefully ASTC can find someone with an Ochre Card to get this workshop up and running.